Victoire Pauline de Riquet de Caraman (1764-1834) was one of eight children of Victor Maurice de Riquet, Comte de Caraman (1727-1807), an officer who in 1787 was named commander-in-chief of the royal regiments stationed in Provence. 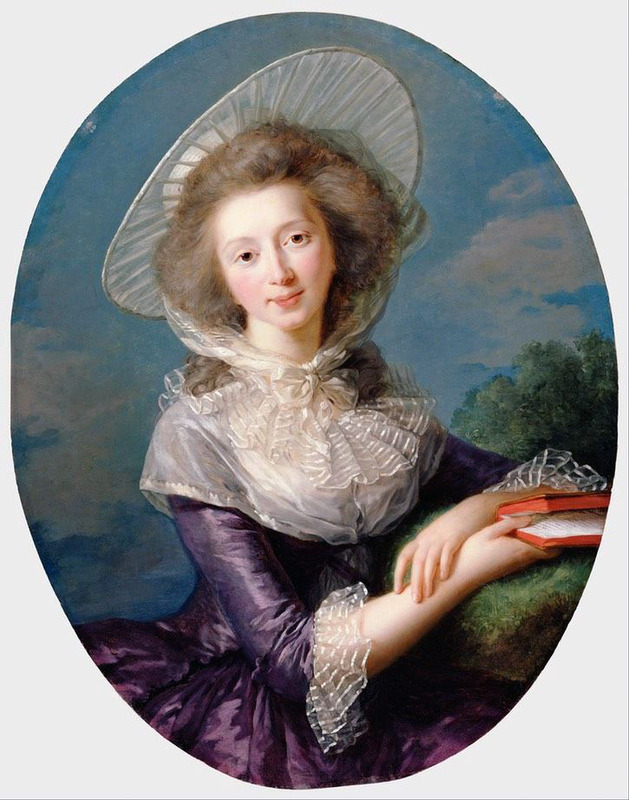 In 1781, she married Jean Louis, Vicomte de Vaudreuil (1763-1816), a first cousin of Vigee Le Brun's most important private patron (see cat. no. 14). During the War of American Independence, he was aide-de-camp to the Marquis de Chastellux. The Revolution stripped the Vaudreuil family of their great holdings in the Caribbean and forced them to seek refuge in several foreign countries. They returned to France, virtually penniless, after the fall of the Napoleonic empire. The Vicomtesse later became lady-in-waiting ("dame pour accompagner") to the Duchesse d'Angouleme (see cat. no. 13). Many of the major works of Vigee Le Brun are painted on wooden panels (for a partial listing, see Baillio, 1980, p. 168, note 25). She first utilized this support after her visit to Flanders in 1782. In Antwerp she made a careful study of Rubens, whose painting entitled Le Chapeau de Paille (the so-called Portrait of Susanna Fourment) (now in The National Gallery, London) inspired her Self-Portrait "au chapeau de paille," (fig. 7). In fact, the portrait of The Vicomtesse de Vaiidreuil has much in common with the latter picture, including a background of cerulean blue sky. The luminous surface of the portrait is built up in thin lavers over an ochre underpainting, with only the highlights impasted. The warm ground is purposely left visible under the loosely brushed-in hair and fichu. The subtlety of the flesh tones are the result of the final glazes. This marvelously refined rubensian technique helps to make the plain featured Vicomtesse appear almost beautiful. The artist's lists account for a second portrait of the sitter, painted during the Bourbon Restoration; this was perhaps a replica of the work shown here. A rectangular copy, which at one time bore an apocryphal signature, last recorded in the De Kay sale, New York, Parke Bernet, March 25, 1964, lot 27, is now in the collection of Mrs. Ilse Bischoff. PROVENANCE: Collection of Baron Edouard de Rothschild, Paris; to his widow, the Baronne Germaine de Rothschild, until her death in 1975; private collection, Los Angeles, until 1980. REFERENCES: Souvenirs, 1, 333; Baillio, November 1980, pp. 161-162, 167, 168, note 16, illus. p. 161, fig. 8; Baillio, March 1981, p. 41, illus. fig. 9 (color).